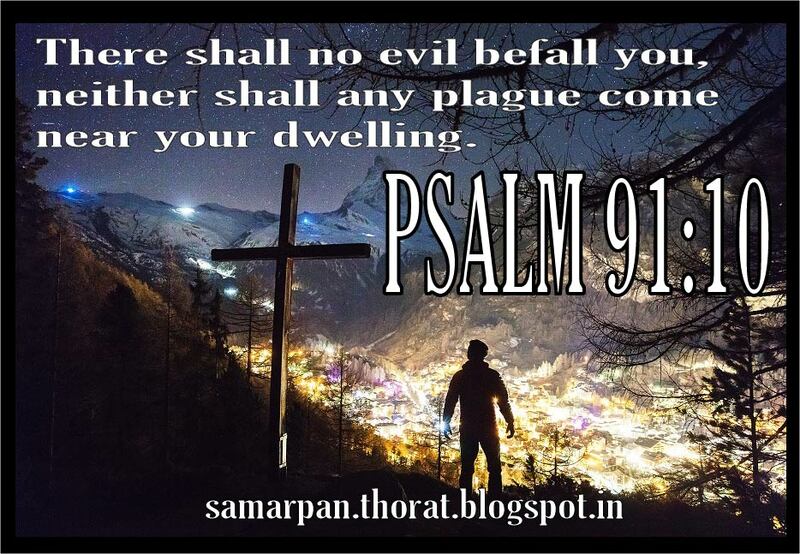 Psalm 91: 10 - There shall no evil befall you, neither shall any plague come near your dwelling. 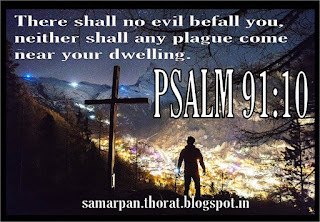 Psalm91: 10 - There shall no evil befall you, neither shall any plague come near your dwelling. As I am close to the Lord, no evil, no destruction and disaster can come near me. The disaster which was supposed to befall me has failed, because I am with my Lord and my Lord is holding me close. My enemy has given up all the plans which were against me. They have packed their bags. They were bidding me goodbye forever. All the plans of the evil one are defeated. Lord, I am thankful to you, that you allowed me to come and stay with you. You opened the door of your house for me. You gave me the Grace to be with you. If you would have not done all this for me then I wonder what would have happened to me. I would have fallen prey to my enemy. Thank you, Lord, for guiding me and helping me. I will always be grateful to you Lord. All power and riches, and wisdom, and strength and honor and glory and blessing belong to you Lord. I will Praise you Lord and Love you Lord with all my heart and with all my soul and with my mind. Dear Lord thank you for your promises Lord, I am thankful to you because no evil work will come against me and no plague come near my dwelling. Thank you for allowing me to be with you and making my dwelling place with you. Give me the Grace to stay with you always, in Jesus name I pray – Amen. I have seen the great and mighty work that my Lord has done for me. I am so grateful to Him. I humble myself before His Mighty presence. I come near the Throne of Grace. I have made a commitment that I will always live under the shadow of the Almighty. Lord, I want to stay with you always. 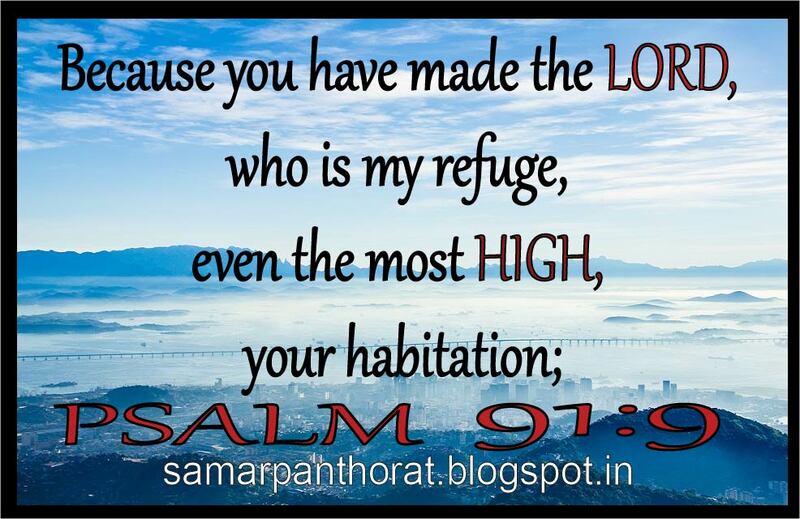 The Lord says to me “I will always be your refuge if you dwell with me”. I say “I will always be with you and in case if I try to go away from your presence, please hold my hand because I am still an innocent child of yours. I still don’t know fully the work of my enemies. I want you to hold me always. Please don’t leave me. I don’t want to lose you and your presence. For the rest of my life, I want to dwell with you”. Psalm 91:8 - Only with your eyes shall you behold and see the reward of the wicked. After defeating the enemy I am seated with my Heavenly Father in the Most High and secret place in Heaven. My enemies who are running away are picked up by the angels and brought in front of my Father. When they stand in front of my Father they are terrified. They have to give an account of what they have done against me. Their plans have failed and they are now in the hands of the Living God. In their mind, they have finally realized that I indeed am a son of my Heavenly Father. My God starts punishing my enemies in front of me, according to their wickedness. Some of them have plotted against me; some have spoken bad words and spread rumors against me. Some have tried to kill me, some have tried to pull me down. According to their deeds, my God will punish them and I will see the reward of the wicked with my eyes.They ask for forgiveness from the Lord but now it is too late. I questioned my Lord as to why He loved me. He told me that it was because I was the work of His hands. He cares so much for me. He protects me, He fights for me, He gives me victory and in front of me, he punishes the evil one. He is a Loving Father; no one can understand the depth of His Love. Dear Lord, thank you for enabling me to see the reward of the wicked one. You truly are a loving God, who loves me so much and who puts my enemy under my feet. Thank you for all the care and comfort that you have given to me in my Life. Give me the Grace to wait patiently to see the reward of the wicked, in Jesus name I pray – Amen.